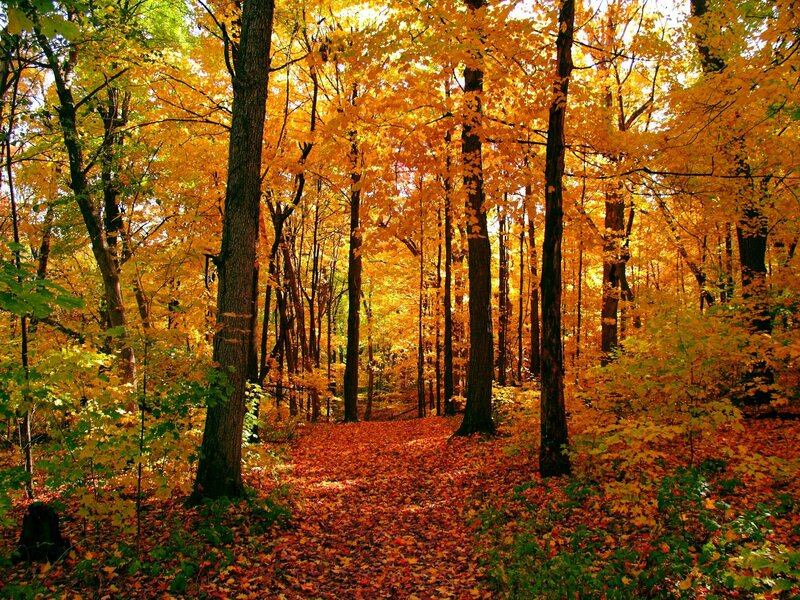 Temperate deciduous forest is a forest where the trees seasonally drop their leaves. More exactly, they drop their leaves typically during winter - the cold season. This is different from tropical and subtropical deciuous forests, where the trees drop their leaves during dry conditions. Even though the areas where those forests grow often do have a dry and a wet season, the leaf drop in those forests is not quite as season-dependent (as in the temperate deciduous forests) - the tropical and subtropical deciuous forest trees can drop their leaves at any time when the climate gets dry, and remain leafless during prolonged droughts. Where are these Forests Found and What Are these Trees? Cool-climate leaf-dropping forests are found in Europe, Russia, Korea, Japan, China, South America, Central Mexico, Canada and the United States. The trees in those forests include birch, aspen, beech, elm, oak and maple. Some of the animals in these forests include raccoons, wolves, deer, foxes, beavers, bears and squirrels. Many of those animals hibernate. The main reason is water conservation, and this applies both to trees that drop their leaves because of winter and those that drop them because of dry conditions. By dropping their leaves, they cannot transpire and they are able to keep the water for winter. But there are both good and bad side effectes. Advantages include the fact that dropped leaves add nutrients to the soil; disadvantages include the energy it costs to grow new leaves every year. But part of that energy is well worth the cost, as maintaining leaves and repairing them from insect bites etc also costs energy. And evergreen trees suffer much larger water loss during winter / dry season. Most of these trees flower while they are leafless. This is to help pollination - the flowers are more visible and also easier for wind to pollinate while there are no leaves. The disadvantage of this is that in some countries these plants risk their flowers getting damaged by frost/dry conditions. Some, but not all temperate leaf-dropping forests put on beautiful colour shows in the autumn. As the leafdropping season comes along, the trees start photosynthetizing less and less, so the green pigments disappear and give the other pigments such as yellow, orange and red a chance to become visible. This only happens in areas with significant seasonal changes when it comes to daylight and temperatures.